As you all know by now, the Pensacola area experienced another devastating flood from the evening of April 29th into the early morning hours of April 30th. 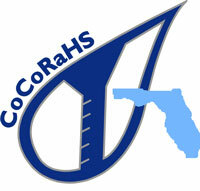 And yet again, CoCoRaHS observers and their observations demonstrated how invaluable they are to the meteorological community. This time around, the official NWS station at the Pensacola Airport failed due to a power issue after 9:53 pm on the 29th. At the time the instruments failed, the station was reporting a rain rate of 5.68" of rain per hour. I worked with members of the NWS Office in Mobile, along with personnel at the NWS Southern Region Headquarters in Fort Worth, TX, to come up with an estimated 24-hour rainfall value based on radar data and the CoCoRaHS stations nearby. While we may never know the exact amount that fell at the airport location, we do know that this event was historic, and we did not want to see it listed as a missing value in the data record. Even with the estimated value (which could very well be an underestimate), Pensacola now has an all-time new 24-hour rainfall record, replacing the one that has stood since 10/05/1934 of 15.29." 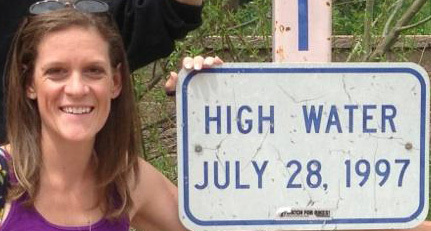 Thank you, once again, for helping fill in those gaps and for making "every drop count!" It's that time of year again! Hard to believe that it's the beginning of May and we are quickly approaching the start of the 2014 Hurricane Season. Last year Tropical Storm Andrea was the only storm to impact the state, though Tropical Storm Karen threatened the state late in the season. Forecasters will issue their predictions for the upcoming season by the end of May, but now is the time to start preparing. June 1st marks the beginning of the year's Hurricane Season, which runs until November 30th. It's been a decade since the "4 in '04", when Charley, Ivan, Frances, and Jeanne crisscrossed the entire state, impacting all 67 counties of the state in some form. And while we've enjoyed a rather quiet time since 2005, when Dennis, Katrina, Rita, and Wilma rattled an already reeling state, Florida is at risk during every hurricane season. You've seen me mention this every year, but it is important that you and your family have a hurricane kit and hurricane plan so that you are ready to act if an impending hurricane threatens your area. Don't be surprised if you see the same information in June's newsletter. 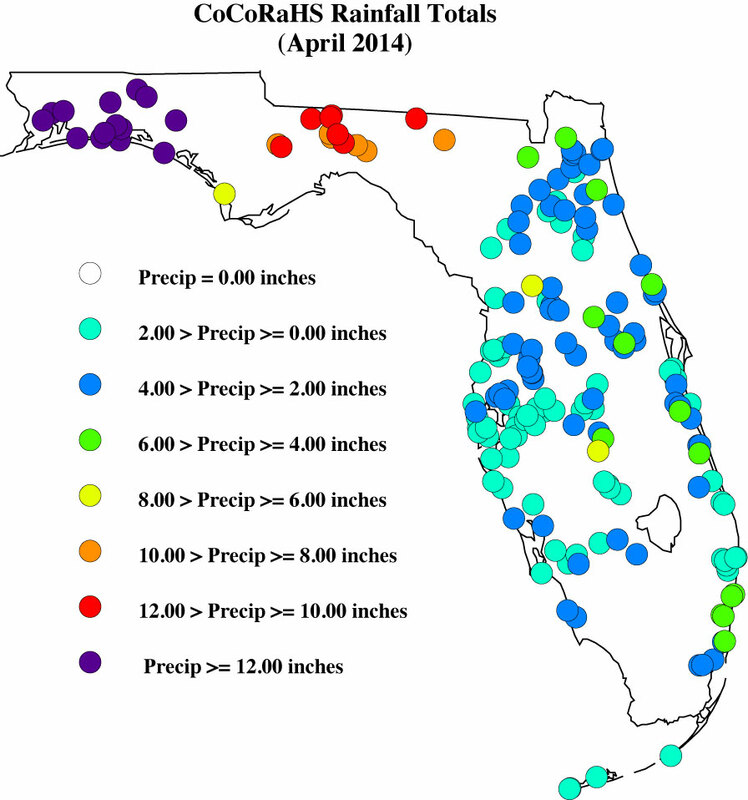 Portions of the Big Bend, northeast Florida, and the Panhandle reported monthly rainfall totals well above normal, while the rest of the state saw near to slightly below average rainfall during April (Figure 1). 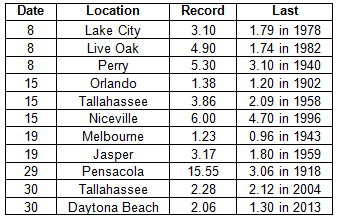 Departures from normal roughly ranged from -1.96" to 17.61" (Table 1), though localized parts of Florida saw rainfall totals that were as much as 2.00" below normal to over 20.00" above normal. 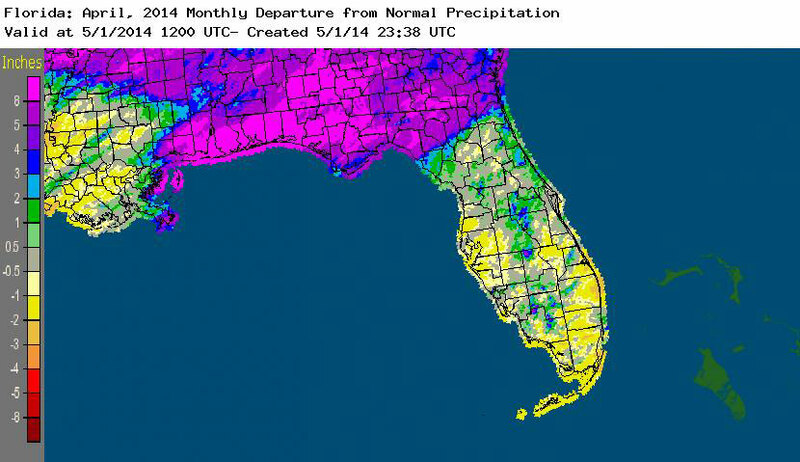 April 2014 was the wettest on record at Pensacola and 3rd wettest in Tallahassee. There were multiple 24-hour precipitation records broken for the month (Table 2). Table 1. April precipitation totals and departures from normal (inches) for selected cities. 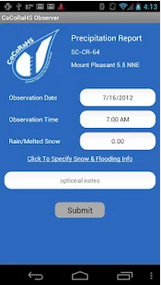 *Values are estimated due to system failure during the flood event on April 29-30, 2014. Figure 1. A graphical depiction of the monthly rainfall departure from normal (inches) for April is given in the figure below (courtesy of NOAA, NWS). Portions of the Panhandle and Big Bend reported April rainfall totals more than 5" above normal during a typically dry month, while slightly below normal (~1-3") precipitation was reported for the Peninsula. The residual dry conditions in portions of northern Escambia and Santa Rosa Counties from the beginning of the month were removed on the April 8th release of the National Drought Monitor. 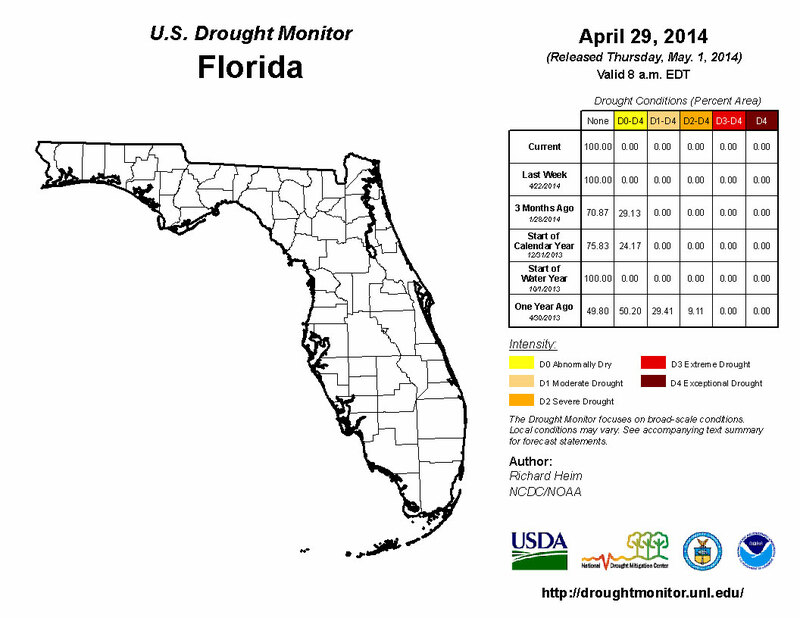 Since then, the state has not had any dry conditions reported.